Jack Ryan Pierce was 5 weeks early in 2003. Like our first child who was born prematurely, we expected he might also experience some developmental delays. We soon noticed Jack had floppy muscle tone. He eventually needed intense therapy to sit-up, crawl and walk. Jack also had extreme sensory issues and refused solid food. At 28 mos. old, Jack weighed just 21lbs. and wasn’t even taking his first steps yet. It was clear he would need a feeding tube placed. 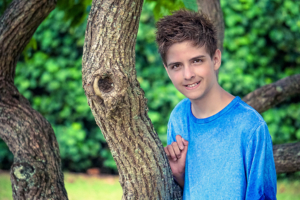 His G-tube helped with nutrition and weight gain, but we were continually frustrated by one diagnosis after another in our efforts to find answers for what was really going on with our son. After another sleepless night of googling online, I came across a parenting board of children with mitochondrial diseases. My heart sank as I read their stories – I was just sure this was the answer. Thankfully, I also discovered we had a mito specialist right here in Seattle! I was determined to get him a referral to see Dr. Russ Saneto. At our first appointment, it was comforting to know we were finally in good hands! After further testing our son received his true diagnoses, Mitochondrial Cytopathy, with defects in Complexes I+III and IV. Naturally we were devastated. Today our brave boy is 13 years old and should be entering the eighth grade, but due to his health, we may explore other options for school. Jack loves to swim, play video games with his brothers and still enjoys teasing his sister when she visits. Jack is still 99% G-Tube dependent on a special formula, and 1% dependent on Cheetos! He wears a backpack and is fed continuously now to increase the calories he’s needed for his adjusted age. I’m happy to say he’s recently gained 15lbs. and has grown several inches! Being hooked up for so many hours hasn’t been easy for our sensory boy, but we are so proud of the way he’s handled these new changes. Jack suffers with sensory issues, chronic pain, small bowel inflammation, autonomic issues, disordered breathing, Cyclic Vomiting Syndrome and reflux. He endures daily fatigue and wears oxygen at night. Despite Jacks daily challenges, we continue to manage new issues as they arise and do our best to keep him well. His days may look much different than most children but he still has the same dreams as any other kiddo. We are so thankful to have Dr. Saneto and his wonderful medical team following Jack’s care. He’s taking a variety of supplements and medications, is getting the specialized care he needs and is thriving today. With the support of the Guild, generous donations and ongoing research, we continue to have HOPE and PRAY daily that a CURE is in the future for our son and all those that suffer from this devastating disease. Stay strong little man!